my iPhone shot of THREE DOZEN cookies! Both natural and Dutch-processed cocoa will work in this recipe. Our favorite natural cocoa is Hershey’s Natural Cocoa Unsweetened; our favorite Dutch-processed cocoa is Droste Cocoa. Our preferred unsweetened chocolate is Hershey’s Unsweetened Baking Bar. 1. Adjust oven rack to middle position and heat oven to 325 degrees. Line 2 baking sheets with parchment paper. Whisk flour, cocoa, baking powder, baking soda, and salt together in bowl. 2. Whisk brown sugar; eggs; espresso powder, if using; and vanilla together in large bowl. Combine chocolate and butter in bowl and microwave at 50 percent power, stirring occasionally, until melted, 2 to 3 minutes. 4. Place granulated sugar and confectioners’ sugar in separate shallow dishes. Working with 2 tablespoons dough (or use #30 scoop) at a time, roll into balls. Drop dough balls directly into granulated sugar and roll to coat. Transfer dough balls to confectioners’ sugar and roll to coat evenly. Evenly space dough balls on prepared sheets, 11 per sheet. 5. Bake cookies, 1 sheet at a time, until puffed and cracked and edges have begun to set but centers are still soft (cookies will look raw between cracks and seem underdone), about 12 minutes, rotating sheet halfway through baking. Let cool completely on sheet before serving. 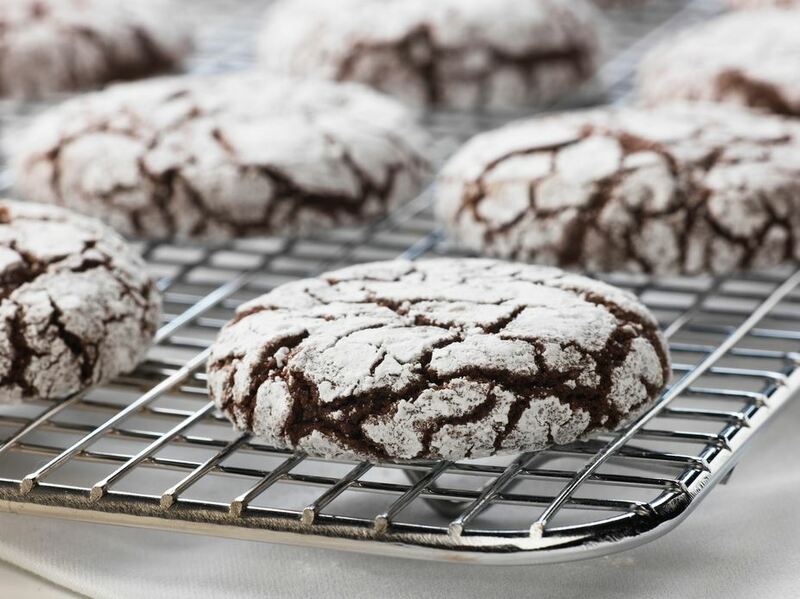 Both unsweetened bar chocolate and cocoa powder add chocolate flavor to our cookies because they contain cocoa solids, but they each have another less obvious way to boost the chocolate. Cocoa’s starch content allows us to cut back on flour, while the chocolate’s cocoa butter means we can use fewer tablespoons of dairy butter. And that translates to bigger, undiluted chocolate flavor. To amplify it further, we also add several teaspoons of espresso powder. Most cookies have top crusts that remain relatively soft and flexible as the cookies set during baking. However, if the top surface dries out before the cookie is finished spreading and rising, it hardens, cracks, and pulls apart, producing an attractive crinkly, cracked exterior. While we found that multiple factors can affect how quickly the top dries out and thus how many cracks are formed (including the temperature of the dough and how rapidly it spreads in the oven), a simple tweak turned out to be key to producing a maximum number of fissures: rolling the balls of dough in granulated sugar before rolling them in powdered sugar. Coating the cookies with either type of sugar draws out moisture from their surface, promoting cracks by drying out their tops before the interiors set. But granulated sugar does so more efficiently because of its coarse, crystalline structure. As the crystals absorb moisture, some—but not all—dissolve into a syrup. As the cookies continue to bake, the moisture evaporates, and the sugar begins to recrystallize, a process that is accelerated by the undissolved sugar crystals, which act as “seed” crystals. When enough new crystals form, they begin drawing out moisture once again. The upshot: acookie with a faster-drying surface that is more prone to cracking.